In most WordPress themes comments and the comment form section are quite boring. Improving the interface can increase your user engagement. In this article, we will show you how to improve default WordPress comments with wpDiscuz. Often users feel that the default WordPress comment system looks outdated which is true. For example, users cannot vote on comments, share them, or subscribe to comment replies. Comment form layout is also the most ignored part in most WordPress themes. Tiny user interface enhancements can actually make a huge impact on how people comment on your site. A plain looking web form is not appealing and encouraging. This is why users move away to third party commenting systems like Disqus. We tried Disqus on WPBeginner, but we switched away because it decreased engagement and total comments – see Disqus review. 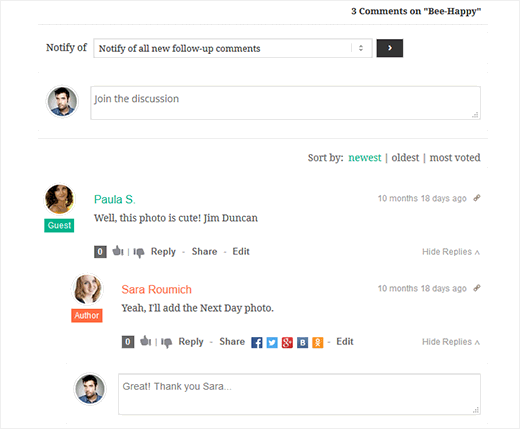 WPDiscuz provides an alternate to Disqus, JetPack, and the default WordPress comments. 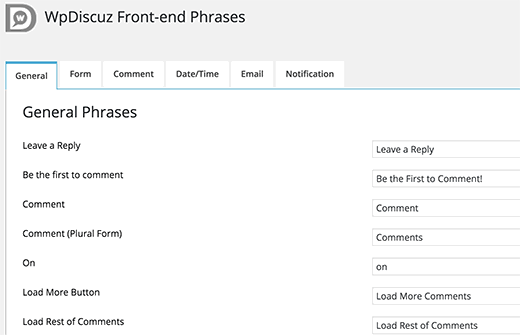 WPDicuz allows you to have all the most desired features while still using the native WordPress comment system. First thing you need to do is install and activate the wpDiscuz plugin. 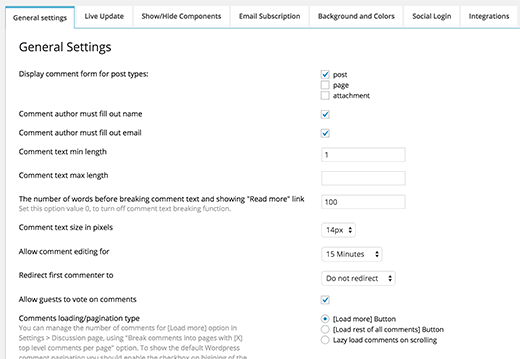 Upon activation, you need to visit Comments » wpDiscuz Settings page to configure plugin settings. The settings page is divided into different sections. The default options should work for most websites, but you can review and change them if you need. The plugin can show newer comments just as they appear. However, this setting is turned off by default. If you are using a shared WordPress hosting, then you should keep it that way. The plugin can still automatically look and fetch newer comments on regular time intervals. WpDiscuz also allows you to change the text displayed for the comments interface. Simply click on Comments » WpDiscuz Phrases to edit them. This feature is particularly useful if you want to change any default text displayed by the plugin. You can also use it to translate the comment form interface into another language. That’s all, we hope this article helped you add a better commenting experience to your WordPress site. You may also want to check out our list of 12 vital tips to combat comment spam in WordPress. I was really impressed by wpdisquz but I was really turned off by the the author’s behaviour. Just wow. But it’s still a solid plugin. WP Discuz is an amazing comment system. I like it… Using it for a while now.. loads faster and it’s always good to have a comment lazy load system which can be activated in it easily. Thanks so much WPBeginner for leaving this article up AND the nasty emails from the developer of this plugin. I came to WPBeginner because it is a trusted resource and I had on my lazy Sunday to-do list “research commenting plugins” just to see if there was something better out there over the native WP commenting system and Discus…which I see everywhere but don’t really like as a user myself. I was really leaning towards this WPDiscuz plugin until I got to the comment from the developer. That, and that alone has turned me off to this plugin and I am now on the hunt for more information. I don’t care is this plugin is free…I would gladly PAY for a plugin that provides the features I need, doesn’t slow my site down and with any luck increases engagement on my blog. FYI, I was thinking about downloading this plugin until the author was being rude … Thank God i read the comments. can i display multiple post or page comments in single page using wpdiscuzz ? I added the WPDiscuz plugin to a site, and though I love it, it removes the ability for users to ignore a commenter, and the members want it back. If I deactivate the plugin, the ignore button is there… Can I add an ignore button to the WPDiscuz plugin? Or disable something in WPDiscuz to bring it back? Hi to All. WPDiscuz is a great WordPress plugin. I use it in my portal. As I manage hundreds of comments every day and use the nesting function, it would be able to cancel a comment and all nested comments from the front end with just one click. Currently I can only edit a comment but not delete it from the front end. Can you add the button “delete”?? Thanks. Please, i configure WpDiscuz for wordpress in my WordPress Dashboard, but still WpDiscuz is not showing on my website. Also comment is not showing on my website. Same problem here. Were you able to fix it? I’ve been researching extending the comment system of my new website. I used to use Disqus but now I want everything hosted on my website. Anyway – I found wpDiscuz and was reading some reviews within the WordPress repository. I found the developer to be really defensive about any reviews less than 5 stars. Some of the reasons the reviewers gave for their less-than-5-star-reviews were quite justified in my opinion. Every plugin has its pros and cons. But now – seeing how litigious he was with WP Beginner – an established and respected blog in my opinion – I’m nervous to even install the plugin to test it. God forbid I violate something in their terms of service and I have to deal with Martin. The comments on this page are ridiculous. A private conversation at best that should have never been public, or really never have been at all anywhere. I’ll be seeking greener pastures. Thank you for this great article. I have only one question: Comments always require moderation – I always get an e-mail when somebody writes a comment to moderate it, the comment need a require. Where can I change this option? I couldn’t find it. I don’t want to require all the comments just let them go appear. You can control email settings by visiting Settings » Discussion page. Look for the section ‘Email me whenever’. You can turn off emails informing you about new comments in moderation. However, we will recommend you not to turn off moderation. Moderation allows you to make sure that no spam comments go live on your website. How can I make that delay from a comment to appear on blog faster? This is an issue for me because visitors will think they commented for nothing ,when they refresh site and they see nothing there.The comment appear on site after 1 minute or more. An effortless admin panel and availability of unlimited features make WordPress a great enterprise content management system. It provides amazing features that can cater to any business requirements and helps to turn your digital dream a reality. It is important for an enterprise to choose the modules and theme that suits the nature of business and fulfills the expectations. To make the website more engaging WP provides various plugins that makes the content more interesting and can trigger the interactions. WPDiscuz is an AJAX controlled real time flexible and responsive commenting plugin that can be added to any WordPress theme. It has dozens of features that makes WPDiscuz a perfect replacement for Disqus. The comments made with WPDiscuz shows time and date of comment and allows other users to reply to that comment. It also provides comment sharing and voting options. There are other very good features of this plugin that are difficult to explain here, but trusting WPDiscuz is a wise thought. Thank you indeed for this How-To article. I’d like to leave some important functions and features you should know about wpDiscuz. We’d like to make this article complete and real informative. These are most important features of wpDiscuz, and this is the 50% of all wpDiscuz power. 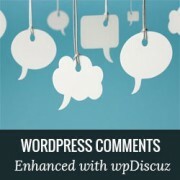 – wpDiscuz is a free comment plugin, which extends the native WordPress comment system. After clicking on activate plugin button you’ll get an awesome comment system even without any configuration. Just one second on click and all is ready. 2. What kind of websites it’s good for? – It removes all limits of WordPress commenting. You can use it for all kind of websites and even on extremely large and active websites. Because it comes with unique “comment getting” and “processing” SQL queries and functions. wpDiscuz brings new generation of WordPress comment processing. It doesn’t use the default WordPress “comment list-er” functions. Those are not optimized and don’t work with large number of comments. 3. How about CDN/cache and speed? – wpDiscuz fully CDN and cache compatible. It’s very fast and becomes faster every day. If some other comment solution is faster right now, it’ll not be in a few days. The frequency of updating and performing this plugin is impressive. We releasing updates every 2-5 days, sometimes just in a 7-10 days. E.g. : we releasing wpDiscuz 3.1.0 within next 24 hours which is 1.8 times faster than current 3.0.9. And the current 3.0.9 is x2 faster than 3.0.6 and so on… So any kind of testing reports becomes outdated in a few days. 4. Does it use AJAX and how about live update? – wpDiscuz is complete interactive, AJAX based comment plugin. It’s super dynamic and comes with real-time commenting features. Just go to Settings > Live update Tab and activate it. It’s very smart and has built-in smart algorithms to avoid server overloading. Also it allows you disable live update for guests. You can set it with new comment notifier buttons or with automatic comment list updater. 6. What about Social Networks? – It has built-in social network sharing buttons, which are fully manageable. Also wpDiscuz integrates and displays all popular Social Login plugins’ buttons with comment forms. So your visitors will be able to login using their SocNet accounts and comment. 7. Is it customize-able, how about UI/UX? – Dozens of options let you do anything that you want with your comments. Integrates perfectly with any theme. All colors, backgrounds, buttons and components are manageable through wpDiscuz Settings Page. Now you don’t have to worry about things breaking if you change themes. All the important output is controlled in the plugin interface itself. – It is super responsive on all kind of devices. Comment threads and forms adapted on all screen sizes. It comes with an intuitive multi-layout design. You get different scaled layouts on desktop, tabs and smart-phones. 9. How about post and comment subscription? “Reply” button is not showing. Does it display images and videos? It seems you’ve disabled nested comments, please set comment nesting value more than one on Dashboard > Discussions page; option: “Enable threaded (nested) comments [X] levels deep”. And enable the checkbox for this option. Yes, just put the image URL in comment content. It’ll be converted to image. Many thanks, just what I was looking for ! The plugin page shows many important features. Why aren’t they tested or reviewed by wpbeginner? Isnt this a post that helps us configure and show us how to use wpdiscuz? Interesting article and some more interesting comment. From my angle, Article favors wpDiscuz more. wpDiscuz being free, is able to compete with a paid tool. This is positive. And beginners always prefer such things. I Myself am searching a plugin to enhance the core functionality of WP default plugin, and I myself am tired of many paid or popular commenting system. Martin, I wouldn’t worry about this article. You have an outstanding product and what this article ultimately does is make more people aware of WPDiscuz. That is a good thing. Anyone who is serious about blogging will fully test and investigate your product against the product mentioned by the author and decide for themselves. They will see all your wonderful features and the outstanding reviews your product has received. And they will most likely decide for themselves based on their particular needs. You are going to gain a lot more exposure and placements by this article than you are going to lose. Thank you very much for your kind words and support. There reason is that our marketing specialists found some issues and we are happy to see those resolved. Thank you WPBeginner for this cooperation. We just spent a little time and found lots of articles about this commercial plugin. We found similar case with Disqus as well. So our lawyers have no doubt, that all articles are sponsored by this commercial product, and all content in this article is promoted too. 1. You should not test and report information which is related to the promoted product. Your information will be always considered as unfair. 2. You are not allowed to promote this product using name, keyword and popularity of another product (in this case wpDiscuz), as well as you’re not allowed to do any kind of anti-advertising with a product you’ve used to promote your commercial plugin. This article should be removed. If you’re not going to remove, then please send your contact information (phone, address, company name) to support[at]gvectors.com email address. Martin, it seems that you don’t understand how personal recommendations work. We recommend what we like, not what plugin authors tell us or “threaten” us to like. You can easily find out all the information you need about WPBeginner LLC. Feel free to pass that along to your lawyers along with the U.S. Constitution. I’ll let this comment slide, so all our users know what kind of company they will be working with should they choose to use WPDiscuz. 1. So…. And how do we improve default WordPress comments with wpDiscuz? We don’t see any information about advantages, functions and features. We just see how to activate this plugin and how to change phrases. That’s all. 2. Why this article instead of guiding us to use wpDiscuz it’s talking about some commercial plugin? We thank you again for your time and your cooperation. Please keep clean the articles which are written for “How-To” meanings and related to free plugins. People and plugin authors will always appreciate it and love this website. In the why use this plugin section, we highlight that wpDiscuz allows you to achieve all the desired functionality that comes with a third-party plugin like Disqus while keeping comments self-hosted and have all the control. The How to part shows how to activate the plugin. Going through each tab is counter intuitive here because those tabs are self-explanatory. Our user wants to know about solutions that exist and why they’re better or worse than other solutions. The only reason why we wrote this article because a user asked us what our thoughts were about wpDiscuz compared to other solutions like De:comments. Your plugin right now is SLOWER than De:Comments. Also De:Comments right now as-is has better UX than your plugin. That’s my honest feedback that you should use to improve your product. Whether De:Comments is free or paid has no impact on our recommendation. The more price conscious users will definitely use a free plugin. While others who are looking for a superior product should know that there are options such as de:comments. I only removed the comparison here so you can be happy. However any smart reader will read through this and see how your company and “smart” marketing react to criticism, and hopefully will avoid using your product. We see you continue advertising this commercial plugin. We don’t ask you to do any tests now. We are owners of wpDiscuz and ask you to remove this article or all words related to the commercial product (btw why the outdated result and the link were not removed?). We don’t want to see wpDiscuz name with this commercial plugin on the same article. The name and the popularity of wpDiscuz is being used to introduce this plugin. The years of our hard work we’ve spent is not for allowing other commercial products to be advertised based on some 0.46 sec speed. Thank you for your time and please remove this article as soon as possible. wpDiscuz has about 70 awesome and very useful features, unfortunately this article readers can only see 5% of them. I really appreciate your time and understand that it’s not possible to introduce the whole wpDiscuz in one article. wpDiscuz is a “All in One” totally free WP Native comment supercharger plugin, which has almost all necessary and lots of extra functions and features. It can 100% fit any kind of website needs. wpDiscuz is also designed for especially very active and large number of comments websites. It works with millions of comments per post. On posts with maximum 100 comments It’s 3 times faster over the alternative plugin you’ve mentioned. And on posts with 1000 comments with can be 5 times faster. Does this comment system decrease the blogs loading speed? I don’t want to install something that might make my blog load slower. wpDiscuz also has comments Lazy Load function. So it loads comments when you scroll page to down. That way you only load the post header and content. The comment section doesn’t use time and memory. It boosts performance delaying loading of comments in long web pages because comments outside of view-port (visible part of web page) won’t be loaded until the user scrolls to them. This reduce memory usage, page loading time and SQL queries. On a page load wpDiscuz only runs plugin settings initiator SQLs, those are about 5. This article looks like an advertising of your plugin. You’re advertising your plugin based on wpDiscuz anti-advertising. We’d ask to remove the VS part, and the link to this commercial comment plugin article, otherwise we’re going to open an lawsuit… You’re not allowed to use wpDiscuz name and popularity to advertise your commercial product. The screenshots are very old, and there is nothing which can allow people to see wpDiscuz’s real advantages. This article author did his best to keep neutral wpDiscuz and advertise the commercial comment plugin. De:Comments has no influence on this article. Our editorial team did the comparison, and we like De:Comments better because it has better UX and it is faster. Instead of reacting poorly to feedback, you should use it and improve your product. 1. There are dozens of comment system for WordPress. Why you decided to do it with a commercial plugin? 2. Why you’ve not talked about 70 advantages, functions and features of wpDiscuz? You only mentioned the speed. And the speed is far from truth. I’ve already leave some video examples. If you’re doing VS you should provide with more details, who the testing was done. 3. Have you read the commercial plugin article? Don’t you see tremendous differences? You’ve mentioned about all function and features on that article. You made lots of screens and displayed as perfect as possible. But the wpDiscuz article just looks like a pic of uninformative text, which only show the commercial plugin advantages and article link. You even put oldest screenshots… This looks like simple SEO trick to bring people to this commercial plugin. Nothing else. 4. Why there is not any information about other comment plugins on the commercial plugin article. But on wpDiscuz article you can see those? And even with back-links. 5. You’re a popular content writers about WordPress and extensions. WordPress is free why are you testing and advertising commercial products with free products? 6. Do you know that wpDiscuz 3.0.9 is x2 faster than 3.0.6, and 3.0.6 x3 faster than 3.0.0, and 3.0.0 x4.5 faster than 2.2.10. And we’re releasing wpDiscuz 3.1.0 in 1-2 days, this will be 2x faster than 3.0.9. Don’t you see how fast this plugin is being improved? Your article is outdated even now. 7. Have you tested those comment plugins on a post with more than 1000 and 10,000 comments? wpDiscuz will be the best for sure. It especially designed for such an active websites. And lastly, we’re the owners of wpDiscuz, and don’t like to see any information about wpDiscuz on this article. So we friendly ask you to remove it as soon as possible. We don’t want to see wpDiscuz name with a commercial plugin on the same blog post.